The steam revolution of the 1800's changed the world as we know it. Now there's a new steam revolution afoot and Bissell and Best Buy are at the forefront. Bissell has created a brand new, multi purpose steam cleaner and vacuum, that will leave your hard wood floors (and more) spotless and sanitized. If you're looking for one of the best floor steamers out there, look no further. We have a lovely, hundred year old home, built in 1914, with hard wood floors throughout. So we were more than happy to be invited to review the brand new, cutting edge BISSELL®Symphony™ All in One Vacuum and Steam Mop! This is the ONLY product on the market that can vacuum and steam at the same time. The BISSELL®Symphony™ is easy to assemble and simple to use. We joke about our home being the vacuum death home, with 4 long haired people, 2 big, hairy dogs, and crafty, active kids. We go through vacuums and area rug scrubbers at an alarming rate. 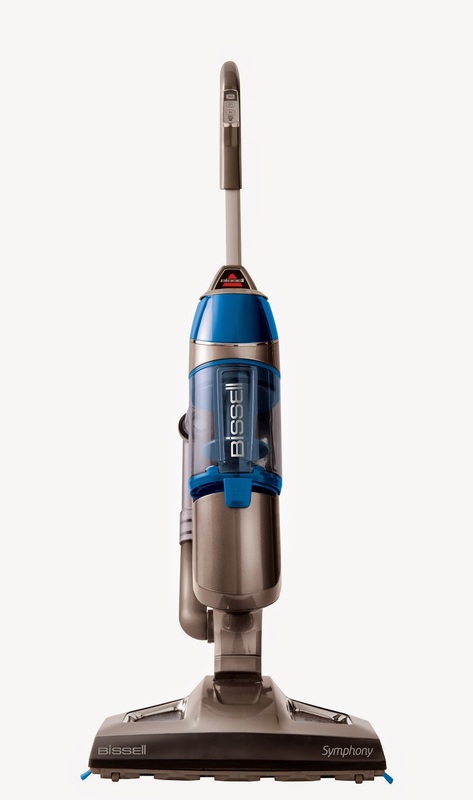 So far, the BISSELL®Symphony™ All in One Vacuum and Steam Mop has been up to the challenge. We're thrilled with the vacuum and steam functions combined into one powerful, sleek machine. Here at ChiIL Mama, we try to avoid harsh chemicals as much as possible, so we're especially excited this steam mop does the job with water! It's one of our favorite features. Cleaning with fresh, pure water is kid and pet safe, and our whole family benefits in the long run. Eco-friendly cleaning rocks! The BISSELL®Symphony™ All in One Vacuum and Steam Mop retails for $219.99 and it's worth every penny. Easily clean your hard floors with the only product to vacuum and steam at the same time, in one easy motion. • Sanitize*Naturally: Get those squeaky-clean floors you trust without using harsh chemicals. With just water, you can steam clean sticky messes while safely sanitizing* your floors. Save time, money, and effort with the Symphony™ All in One Vacuum and Steam Mop. And say goodbye to your dirty, old mop and broom. Power through tough spots with two Microban mop pads to choose from—one soft, one for scrubbing. Microfiber mop pads are infused with Microban antimicrobial protection to help fight odor-causing bacteria. Disclaimer: Once again, ChiIL Mama is elated to be part of the Best Buy WOLF Blogger Network. The reviewer has been compensated in the form of a Best Buy Gift Card and/or received the product/service at a reduced price or for free for sharing this review with our readers. As always, all opinions are our own.